As of today (February 1, 2016), multi-family complexes in Calgary are required to provide on-site recycling options for residents. Multi-family complexes are defined by ‘five or more units on the same parcel of land’, ex: apartments, townhouses, condos, mobile home parks, co-operatives and housing developments on private roads. If you are a condo owner or living in a multi-family complex, and you have not been informed of recycling in your complex, it is advised that you get in touch with your property manager or condo board. Who will provide the service? there are a number of private recycling companies offering this type of service, and many will communicate with your residents as well. Find a company that fits the needs of your building. Green Calgary is putting together this directory of private recyclers. Where will you store recycling? 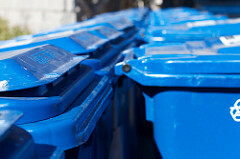 an important step is to decipher where you will place your recycling bins and storage for the items between pick-ups. Condo owners and managers alike should check out the City of Calgary website for more information and available updates on multi-family recycling. Calgary Luxury Home Search © 2019. All Rights Reserved.